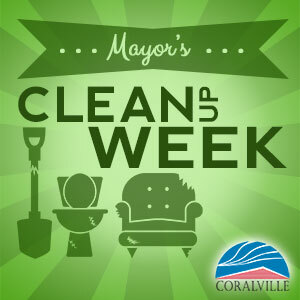 Held in the spring and fall, Mayor's Clean Up Week is a great time to set out items too large to fit in your garbage cart -- such as broken furniture and bathroom fixtures -- for free garbage pickup. Place items too big for your trash cart at the curb up to 24 hours before or by 7:00 am on your regular trash collection day. Remove items not taken in the pickup from the curb within 24 hours after collection day. Metal is picked up by a separate truck and may be picked up on a day that is different from your regular collection day. As usual, tag extra bags of garbage, and put yard waste in biodegradable Coralville yard waste bags or in a 33-gallon container with an annual yard waste sticker. Construction materials, appliances, electronics, or hazardous materials will not be picked up. For unwanted but usable building and housing materials, consider donating them to Iowa Valley Habitat for Humanity ReStore, located at 2401 Scott Boulevard SE in Iowa City, rather than sending them to the landfill. ReStores sells the items and the proceeds support Iowa Valley Habitat for Humanity; donations are tax-deductible. ReStore accepts shelving, appliances, building and plumbing supplies, hardware, tools, cabinets, furniture, lighting, doors, windows, tile, flooring, and more. Free pickup is available. To schedule a pickup or learn more, visit www.iowacityrestore.com or call 319.338.5687.